Amadablam expedition is one of the most famous peaks in the world. Amadablam Expedition is a dream of every Alpinist. This peak is 6,812 meters high which is an awesome altitude . Since this peak is also one of the most preferred peaks through several Adventure lovers. Amadablam is also known as Mothers’ Necklace. The word “Ama” which simply means “Mother”and “Dablam” means Charm box. Sherpa women wear this special pendant. Bharal Adventure assures you to help you know every single amazing facts of the Amadablam. For trekking; July to the end of November is the most popular time because of good visibility. Ama Dablam was first climbed on March 13, 1961, by Mike Gill (NZ), Barry Bishop (USA), Mike Ward (UK) and Wally Romanes (NZ). They were from the Southwest Ridge. The most popular route by far is the Southwest Ridge. Bharal Adventure will lead you towards the destination. Climbers usually set up three camps along the ridge with camp just below and to the right of the hanging glacier, the Dablam. . The 2006 Avalanche a night to remember and a horror nightmare. On the night of 14 November 2006, a large serac collapse occurred from the glacier, Dablam. The avalanche swept away several tents at Camp 3, killing six climbers (3 European, 3 Sherpa). It is often recalled in the history of deaths at the Ama Dablam. Bharal Adventure offers you this amazing tour just in 30 days. With the experienced guide promising to help you in every step of your journey and other Bharal Adventure Expeditions Team We will try to make your journey one of the best moments of your life. The most popular route by far is the Southwest Ridge. Bharal Adventure will lead you towards the destination. Climbers usually set up three camps along the ridge with camp just below and to the right of the hanging glacier, the Dablam. . The 2006 Avalanche a night to remember and a horror nightmare. On the night of 14 November 2006, a large serac collapse occurred from the glacier, Dablam. The avalanche swept away several tents at Camp 3, killing six climbers (3 European, 3 Sherpa). 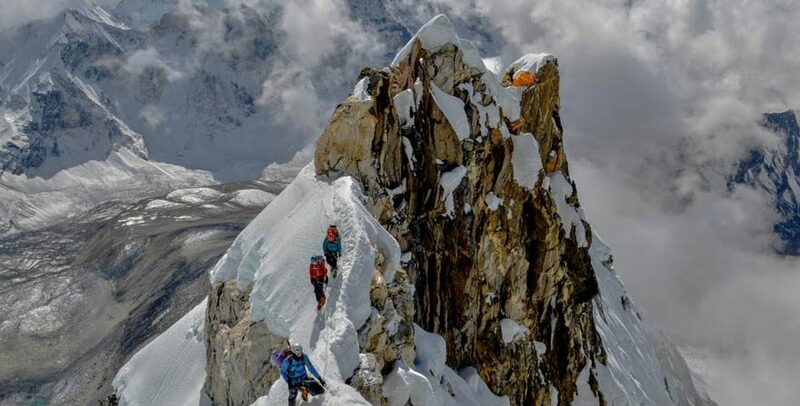 It is often recalled in the history of deaths at the Ama Dablam. Ama Dablam is approximately 70 million years old and was formed when the Indo-Australian continental plate collided with the Eurasian Plate. Ama Dablam is the third most Himalayan range and peak preferred by explorers and permitted by the government of Nepal. It is a fact but very strange that with elevation less than 7,000m. It is the fact that we can experience the best view of the peak. The best view of the mountain Ama Dablam is believed to be witnessed from Tengboche. The most popular route by far is the Southwest Ridge. Bharal Adventure will lead you towards the destination. Climbers usually set up three camps along the ridge with camp just below and to the right of the hanging glacier, the Dablam. . The 2006 Avalanche a night to remember and a horror nightmare. On the night of 14 November 2006, a large serac collapse occurred from the glacier, Dablam. The avalanche swept away several tents at Camp 3, killing six climbers (3 European, 3 Sherpa). It is often recalled in the history of deaths at the Ama Dablam. Ama Dablam is approximately 70 million years old and was formed when the Indo-Australian continental plate collided with the Eurasian Plate. Ama Dablam is the third most Himalayan range and peak preferred by explorers and permitted by the government of Nepal. It is a fact but very strange that with elevation less than 7,000m. It is the fact that we can experience the best view of the peak. The best view of the mountain Ama Dablam is believed to be witnessed from Tengboche. Today after breakfast, we start a guided tour to several of the most historical and spiritual attractions in Kathmandu which are also UNESCO World Heritage sites. We visit the historic Durbar Square, the sacred Hindu temple of Pasupatinath, the famous 'Monkey Temple' (Swayambhunath) and Buddhist shrine (Bouddhanath), which is also one of the largest stupas in the world. After the tour, we get our equipment checked by our climbing leader, get introduced to fellow participants, and discuss our trip at Bharal Adventure office. Overnight in Kathmandu.Accomodation: Hotel: along with breakfast. We begin trekking after breakfast. Our trail passes through pine forests and we also walk alongside the Dudh Koshi River. After walking for around an hour, we begin to see Mt. Thamserku (6,608m) on our right. We continue our trek through lush pine, fir and juniper forests, cross a few suspension bridges and reach Namche Bazaar. The small town is the main trading center of the Everest region. Overnight in Namche Bazaar.Accomodation: Tea house. We trek further along the Everest route and pass through beautiful villages and cross the Dudh Koshi River while also enjoying magnificent views of the Himalayan peaks like Everest, Lhotse, Nuptse and Ama Dablam along the way. After ascending on a steep trail, we reach the Tengboche Monastery and spend some time there. It is one of the oldest and most famous viewing points in Nepal .Mani Rimdu is one of the most fascinating Buddhist festival observed every year in Everest Region, usually in November (date fixed by lunar calendar) in Tengboche monastery. This is the festival of Sherpa people celebrated during on 4th, 5th and 6th November. Accommodation: Tea house. This day is set aside just for acclimatization. This will help minimize the chances of anyone being affected by AMS (Acute Mountain Sickness). Today we climb a terrain above the Pheriche village as it is well suited to give us a good hiking experience in a cold condition. After an uphill climb to the top of the hill, we are rewarded with great views of the Himalayas. Overnight in Pheriche.Accomodation: Tea house. Your adventure in Nepal comes to an end today! There is nothing to do but trade emails with your travel companions and organize your photos. A representative from Bharal Adventure will take you to the airport, approximately 3 hours before your scheduled flight. On your way home you'll have plenty of time to plan your next adventure in the wonderful country of Nepal.